Aside from the difficulties inherent in estimating the value of privately-held companies, Forbes’ calculation of Fidel Castro’s fortune is fraught with other problems. Due to a severe lack of information, the number of enterprises it took into account was very small in relation to the large number of businesses said to be under Castro’s control. In addition, Forbes’ calculation of Castro’s net worth fails to take into account funds in bank accounts all over the world, large inventories of assets inside Cuba, and real estate holdings both in Cuba and overseas, all reported to belong to Castro. Yet, given the serious methodological flaws of Cuba’s GDP statistics,2 the new approach might provide a sounder approximation to Castro’s wealth. At least, its basis is the market value of clearly designated assets, even when it may differ from Castro’s actual holdings. Because of the large, intricate, and secret nature of these business activities, all estimates of Castro’s worth are probably imprecise. Nonetheless, all attempts appear to be well shy of the vast wealth under his control. The testimonies of former regime insiders provide telling snapshots of the enormous assets that Fidel Castro and his brother Raúl control. Arguably, they offer damning substantiation of their existence, regardless of their precise value at any given time—which appears to fluctuate widely as substantial assets flow in and out constantly. What is striking about defectors’ accounts is their consistency, which is impressive because they originate from independent sources, who have had dissimilar access to the structure of power, and whose testimonies cover different events and stages and have been collected over a long period. Over the years, many of these accounts have appeared in lowprofile media reports in different countries or have been published as memoirs written almost exclusively in Spanish and widely ignored by the international mainstream media. In systematically compiling this assortment of tales, a coherent story emerges of a vast international conglomerate sustained by sophisticated financial dealings in world capital markets. What we call in this paper Fidel Castro, Inc. brings together scores of enterprises, sizeable hard currency holdings, and numerous real estate assets inside and outside Cuba, all under Fidel or Raúl Castro’s personal control and hidden from official national statistics. Fidel Castro, Inc. enjoys a rare advantage: the free exploitation and use of the resources—both capital and human—of an entire nation, free of oversight and taxation. Cuba is a totalitarian state controlled by Fidel Castro, who is today the longest-serving head of state. In power since 1959, he is chief of state with the titles of President, Head of Government, First Secretary of the Communist Party, and Commander in Chief of the Armed Forces. In March of 2003, already after 44 years in power, he officially declared his intent to remain in office for life. During his entire tenure, his brother and designated successor, Raúl, has been Head of Cuba’s Armed Forces and his principal and loyal ally. The regime they command denies basic civil, political, and economic rights to its citizens. Arguably, Fidel Castro “owns” most of Cuba. As supreme ruler of one of the world’s most tightly-held and closed economies, the level of usurpation of a country’s resources by one person that he has managed to carry out seems comparable in modern times only to that of present North Korea under the Kim Jong Il and his father, the late Kim Il Sung, before him. For nearly five decades, Fidel Castro has arbitrarily controlled and had at his sole disposal practically all of Cuba’s financial and economic resources. According to countless first-hand reports by former regime higher-ups, Fidel alone has the last word on all decisions affecting the political and economic destiny of the entire Cuban nation. Most Cuba experts and scholars agree on this point. Alcibíades Hidalgo, one of the highest-ranking officials to flee the island,6 explained: “It is simply impossible to undertake any political or economic initiative in Cuba. The only option one has is to surrender to the dictates of the regime and to the thinking of the one and only maximum leader, who is above all the citizens. … Fidel is accountable to no one and is able to live his own reality.” 7 Many other former top government officials uniformly describe Fidel Castro’s direct personal control over the country’s finances and the absence of separation between public property and de facto private property under his command. His brother Raúl, head of the Armed Forces and designated successor, is intimately linked to these practices. The subordination of the common citizen to the state in all economic (as well as political) aspects assures that no one other than designated top government officials can accumulate wealth. In fact, only Fidel Castro enjoys true economic independence— as he retains exclusive discretion over the nation’s resources. A former member of the Castro brothers’ inner circle and comrade from the Sierra Maestra struggle, Dariel Alarcón Ramírez, defected in Paris in 1996 after holding many high-ranking government posts with the closest access to the Fidel and Raúl. Better known by his nom de guerre “Benigno,” his autobiographical narration of the many years by Castro’s side provides an incisive look into the patterns of patronage, corruption, and absolute control over state resources by Castro and the highest members of the ruling elite.9 His sobering account coincides with those of many former higher ups of the Castro regime; some are cited in this paper, others have been obtained anecdotally over the years. What insiders commonly refer to as “the Comandante’s reserves,” consists of an integrated system of overseas bank accounts as well as the national reserve of fleets of automobiles and trucks, fuel, and stores of food and consumer and luxury goods for the elite. 10 A large and complex web of enterprises inside and outside Cuba funnels funds and goods to these reserves and are commanded by high-ranking members of the nomenklatura and the Armed Forces, both in active service and retired. The “Comandante’s reserves” are reportedly replenished through schemes that include: (1) an assigned percentage of revenues from tourism, remittances from abroad, and of hard currency businesses operations inside and outside Cuba; (2) the hard currency earnings of Cubans employed overseas or doing business overseas but under the authority or control of the Cuban state; (3) the sale of Cuban state assets to foreigners;11 (4) the sale abroad of Cuban art, artifacts, jewelry, antiques, and other valuables taken when their owners leave the country; and (5) revenues from drug trafficking and criminal activities perpetrated by subversive and terrorist groups with the help of Cuban agents or coordinated by Cuba. Cash resources are systematically diverted to bank accounts over which Castro maintains sole discretion in Switzerland, Grand Cayman, London, Lichtenstein, and Panama. • Banco Financiero Internacional (BFI), founded in 1984 as the first Cuban entity operating in dollars and with total autonomy from the formal state system. By 1999 it had sixteen branches in Cuba and an unknown number abroad (including in the United Kingdom and Canada). Its initial objective was the removal from the National Bank of Cuba of transactions intended to leave no trace. Its main clients are the same firms associated with the “Comandante’s reserves.” Foreigners stand in for all its official business. • Banco de Inversiones, S.A., which makes loans to the Cuban government at high interest rates and is allegedly run by or in conjunction with an Israeli citizen. The bank’s capital is suspected to come from the Banco Financiero Internacional. • Aerogaviota, S.A., provides air transportation to the tourism industry and rentals to foreign businesspersons. It operates an airplane and helicopter fleet from its headquarters at the Baracoa Military Air Base, near Havana, and is staffed only with military personnel. • Almacenes Universal, S.A., operates several free trade zones. • Almest S.A., builds hotel facilities and other real estate for the exclusive use of or sale to foreigners. • Agrotex S.A., activities such as cattle raising, cattle breeding, and bee keeping. • Antex, S.A., controls various types of offshore and holding companies that import and export timber, ships, and the like. It has offices in over ten countries, including Panama, Angola, South Africa, and Namibia. • Empresa de Servicios La Marina, provides security and maintenance services for all of GAESA’s support personnel. • Gaviota, S.A., operates over 30 hotels all over the island, mostly with foreign partners (including Sol Meliá and Club Med) and involved in other activities in the tourist industry. • Geocuba, S.A., is engaged in the cartography business19 and deals with land concessions or leasing related to tourism and other sectors such as mining, agriculture, and real estate. • Sasa S.A., operates a chain of automobile repair shops and gas stations throughout the country. • Sermar S.A., operates shipyards for all naval repairs. • Tecnotex S.A., imports and exports product needed by the other companies in the holding. • TRD Caribe, operates over 400 “Currency Recovery Stores” (Tiendas de Recaudación de Divisas) throughout the island, selling products only in hard currency. Reportedly, it generates more than one hundred million dollars per year. This operation is under the División Financiera, whose goal is to recycle and reinvest income generated by the GAESA network. • Medicuba, which sells pharmaceutical products manufactured in the country, especially vaccines, and generates an unknown amount of revenue estimated at several million dollars. The enterprises mentioned above and in the Appendix have been specifically named in reports by former regime insiders. Most are classified by the Office of Foreign Assets Control (O.F.A.C.) of the U.S. Treasury Department as blocked entities, or “designated nationals,” of the Cuban government.29 A large number of the overseas firms are located in Panama and Spain, but others are based in other countries in Latin America and Europe, while some are located as far as Japan. 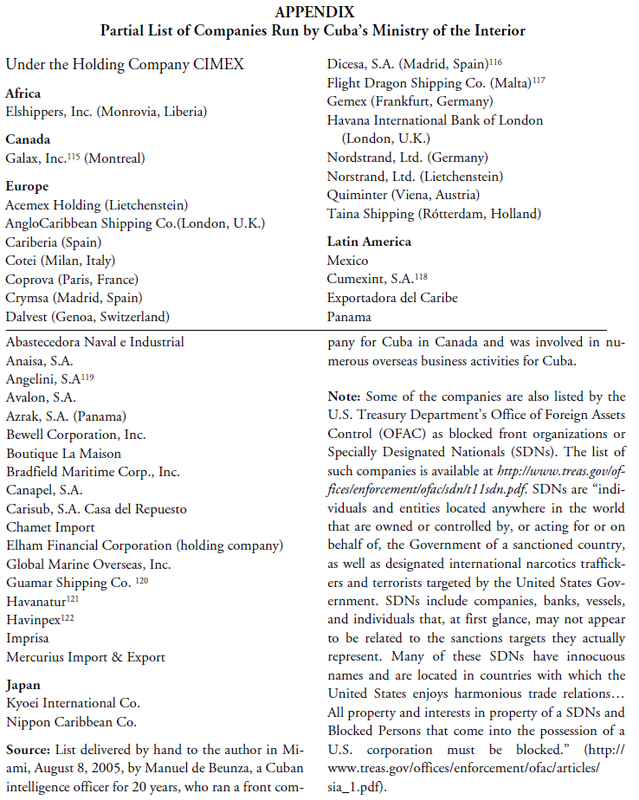 Aside from this list, many more enterprises controlled by the Castro brothers are said to exist inside and outside Cuba operating in India, South Africa, Malta, and Grand Cayman. Some have been designated by O.F.A.C. ; others are yet to be identified. It is more difficult to identify enterprises formed overseas under the Castro brothers’ control. Most have been incorporated under the names of Cuban officials or foreign nationals in association with the Cuban government. Manuel de Beunza, who managed—as its owner—a Cuban company involved in all sorts of shipping activities in Montreal, reports having opened many such companies and eighteen bank accounts under his own name.31 Oftentimes, he asserts, the overseas corporations are established under the name of lawyers or other intermediaries in different countries who receive payment for these services. For example, Havanatur, a company with subsidiaries and offices in Cuba as well as Bahamas, Chile, and Argentina, was run by a Chilean.32 The Cuban and foreign individuals who appear as owners and typically serve as managers are allowed a participation in the business by way of juicy compensation packages, a lavish lifestyle if abroad, and other privileges. This happens as long as the Castro brothers are guaranteed a certain share and the leakage remains within certain bounds. An issue meriting further exploration is the allegation that Cuba uses overseas companies fronting for Castro as collateral for hard currency loans obtained abroad by different entities of the Cuban state.40 This would provide a plausible explanation to the seeming foolishness of foreign creditors’ huge short-term loans to Cuba in recent years.41 Given Cuba’s longstanding default and moratorium on external debt repayments, 42 its obvious lack of creditworthiness,43 and the wretched state of its economy, the continued extension of credits to Cuba is otherwise perplexing. To funnel monies to foreign banks, complex evasion operations are undertaken to deliver cash through courier routes. One route is reported to have ended at Cantonal Bank in Geneva. Agent Otto also reports that, at the time of his defection a few years ago, the Banco Financiero Internacional (BFI), a subsidiary of Promotora S.A. of Panama, was a key part of this system. Reportedly, the Office of the Secretary of Cuba’s Council of State opened an office in Zurich under the name Financiera de Cubalse (Cubalse’s Financial Institution), an entity that works with an office of Cantonal Bank in Geneva. In addition, large amounts of funds are “transferred” from BFI to Financiera de Cubalse. Castro allegedly makes loans from his overseas “reserves” to the national economy to cover hard currency shortfalls at an interest of ten percent, regardless of the length of the loan.54 In the 1980s, Jesús Marzo Fernández was aware of transactions to cover oil imports as well as two specific transactions—for US$20 million and US$30 million respectively—to import foodstuffs.55 This, of course, represents a steady source of income to replenish Fidel’s reserves. After 46 years in power many government insiders, foreign visitors, and average Cubans—former staff, acquaintances of children of the elite, etc.—have reported about multiple residences and recreational facilities in Cuba set aside for Fidel Castro and his family for their personal use. Fidel’s daughter, Alina, mentions several “Protocol Houses” used for dignitaries and friends of Castro, information that is confirmed by other defectors.56 The long list includes anywhere from 25 to 37 homes57 all over the island; many are said to be used only occasionally for short rest periods during travels throughout the island or to entertain guests. These include a number of recreational residences at beaches and in the countryside, ranches, hunting grounds, specialized fishing and cattle reserves, a shrimp breeding facility, and luxurious underground bunkers outfitted with the latest technology.58 Some have their own electric generation and water plants, sophisticated communications’ command facilities, and enjoy amenities such as pools, tennis courts, marinas, and even golf courses. Among Castro’s overseas properties is said to be a castle in Austria,59 and large ranches in Galicia, Spain; Monterrey, Mexico; and near New Delhi, India. 60 According to a former insider who had access to the information in the 1980s, those four properties were at the time considered the preferred safe havens in case Castro had to exit Cuba, as the leaders of those countries could be relied on to offer Castro personal protection.61 Reportedly, properties have been also purchased by Castro or for his use in France, Sweden, Switzerland, Finland, Italy, Bahamas, Tanzania, and Egypt, and properties in Ecuador are said to be under the control of Raúl and his wife’s family. 62 Different mechanisms are used to disguise the ownership—using designating trustworthy people, foreign companies, or individuals who are compensated for this service. It is impossible to ascertain which of these properties might presently be held by Castro. The involvement of high-ranking Cuban government officials in international drug trafficking under the orders or with the knowledge and acquiescence of the Castro brothers has been long alleged. Consistent reports abound from former regime insiders, members of Colombian and Mexican drug cartels, from intelligence officials of the former Soviet Union and its satellites, and from journalists, governments, and even world leaders—including the Presidents of the United States and Colombia.63 In fact, four highranking Cuban officials have been indicted in the United States on drug charges. In addition, there are plentiful reports of the links between Fidel Castro and Robert Vesco in money laundering and drug trafficking activities. Vesco, a fugitive from U.S. justice, lived in luxury and with the protection of the Cuban leader since 1980, but fell in disgrace in 1995 and was sentenced to thirteen years in prison, which he is serving on the island. Norberto Fuentes, the Revolution’s former author and a member of the Castro brothers’ inner circle, has provided a wealth of information on drug, money laundering, and robberies perpetrated by Cuban agents or coordinated by Cuba with full knowledge and direction from Fidel Castro. He gives ample detail on the criminal activities of terrorist groups that have netted Cuba millions of dollars to sustain the Castro regime and finance international terrorism, subversion, and “liberation movements.” According to Fuentes, an operation conducted with the Democratic Front for the Liberation of Palestine resulted in a booty of one billion dollar from bank robberies in Lebanon during the 1975-76 civil war there.72 Cuban agents Alfredo Sugve del Rosario and Filiberto Catiñeiras (known as “Felo” 73) headed the small Cuban team that transported the treasure to Cuba: gold bars, jewelry, gems, and museum pieces. The fortune was dispatched in diplomatic pouches, each carried by two Cuban agents, during 28 successive days via air Beirut-Moscow-Havana. Castro personally greeted Sugve and Castiñeiras upon their arrival on the last flight of the transfer, declaring them “heroes.” Fuentes reports that the treasure was displayed in eleven tables set up inside vaults, where Castro took members of the Political Bureau for viewings. The whereabouts of the treasure are unknown. The money-laundering question was recently fueled by a May 2004 US $100 million fine imposed by the New York Federal Reserve Bank on UBS (Union of Banques Suisses) Investment Bank of Switzerland. The fine was announced in conjunction with the Swiss Federal Banking Commission and was imposed for violating the terms of an agreement to act as repository of U.S. banknotes, under the Extended Custodial Inventory Program (ECIP). This program allowed foreign and U.S.-owned banks that contracted with the New York Federal Reserve Bank to be repositories of large inventories of new U.S. bank notes in order to remove old bills in circulation. UBS had been caught buying and selling U.S. dollars to countries under U.S. sanctions—Iran, Libya, Yugoslavia, and Cuba—and filing fraudulent reports to conceal this activity.84 The transactions with Cuba, totaling US$3.9 billion over a period of seven years, were by the largest by far. In essence, UBS had knowingly been accepting old dollar bills from Cuba and, instead of exchanging them for new bills, as required, had been crediting accounts held by Cuba or unnamed sources from Cuba and filing phony reports. Importantly, UBS has refused to publicly reveal in whose name are the accounts controlled by Cuba, alleging “client confidentiality.”85 This is strange, as the obvious holders of such accounts would be official entities of the Cuban government, the Cuban Central Bank the most logical one. A respected economist and expert in Cuban affairs, Ernesto Betancourt, states that “Cuba cannot justify 600 or 700 million dollars annually in cash through tourism income. The tourists—Canadians, Europeans and Latin Americans—buy their travel packages with credit cards at travel agencies.”86 Remittances from abroad would also be insufficient to explain the large volume of cash. That money is usually sent via wire transfers, not paper money, and only a portion of remittances are carried into Cuba as cash in violation of U.S. embargo limits. In addition, total remittances are estimated between US$450 million and $800 million annually and are mostly absorbed into the economy by way of the Tiendas de Recaudación de Divisas, state-owned stores that sell goods only in dollars. A large percentage of the recovered dollars would be used to purchase imports and would be reflected in official Balance of Payment accounts. WHAT DOES THE COMANDANTE DO WITH HIS RESERVES? Fidel rules over one of the poorest countries in the world, yet he could well be, as a Cuba scholar suggests, the most powerful world leader in terms of the discretion and lack of oversight over his financial decisions. 87 He can do what not even the political leaders of wealthy and powerful countries or the CEOs of the world’s richest companies are able to. On his sole command, he can give away houses, cars, and luxury goods to the Cuban ruling elite, donate hospitals, airports, manufacturing plants, sugar mills,88 vaccines, and humanitarian assistance to other countries, provide scholarships to thousands of students from around the world to study in Cuba,89 or offer medical treatment—all expenses paid—to people from all over the world.90 He is able to do all this without audits or accountability, regardless of any budgetary or fiscal considerations, beyond the constraints of any laws, and mostly outside the realm of national accounts. Historical examples abound of Cuba’s financing and support of international terrorism, subversion, and liberation movements.91 Propaganda and public relations, including bribing world leaders, has long been a priority for Castro, one that helps explain the regime’s disproportionate international influence.92 Historically, a huge amount of resources has been spent on swaying international public opinion to further Castro’s political goals93 and cultivating the support of influential international figures in all fields. Huge sums are also involved in Castro’s personal security and travels inside Cuba, although specifics regarding how this is funded are lacking from defectors and remain unclear by looking at Cuba’s financial statistics.94 The cost of Castro’s foreign travels is enormous. Castro’s former bodyguard reported that 200 bodyguards and a medical team accompany Castro on his trips abroad.95 Likewise, there seems to be no limit to the resources available to Fidel Castro, whether for his pet projects or his personal security and enjoyment. Although top members of the nomenklatura enjoy privileges unavailable to the population, 96 the lifestyle of Fidel and Raul’s families and their access to all sorts of goods and services not available to the Cuban population is unrivaled. Yet, they together with the highest members of the government elite have strict orders to avoid appearing ostentatious and to stay out of the limelight.97 Excesses by former insiders such as former Minister of the Interior Jose Abrahantes and the de la Guardia brothers, was widely reported in the seventies and eighties, and was tied to activities at the MC Department during the early days of CIMEX.98 But, after they were purged, the most outlandish practices at the top of the power ladder have apparently been greatly curtailed. In essence, the critical factor in keeping Fidel, Inc. running efficiently, profitably, and successfully is— as in all capitalist ventures—to have a clear vision, to implement a coherent strategy, to offer products that sell thanks to winning marketing techniques, and to maintain effective operational systems and management controls. It appears that Fidel Inc. is an extraordinarily successful and gigantic enterprise poised to remain so as long as its fundamentals remain in place. 1. Forbes has been estimating the net worth of Royals and Rulers for almost a decade. Because their fortunes are often tied to their positions and their wealth does not come strictly from business operations or inheritance, as in the case of most Forbes billionaires, they are listed separately. The valuations are estimates and not precise numbers and are derived from identified holdings of private companies and estimates of their revenues and, at times, their profits. The list can be viewed at http://www.forbes.com/billionaires/2005/03/10/ cx_lg_0310royal_bill05.html. Written statement from the Editors of Forbes Billionaires’ Edition, E-mail to the author, September 26, 2005. 2. The methodological deficiencies of Cuba’s GDP statistics are detailed, e.g., in Mesa-Lago, Carmelo, “ECLAC’s Report on the Cuban Economy in the 1990s,” Cuba in Transition—Volume 8 (Washington: Association for the Study of the Cuban Economy, 1998), pp.130-133 and Sánchez, Nicolás, and Miles Cahill, “The Strengths and Weaknesses of Factor Analysis in Predicting Cuban GDP,” Cuba in Transition—Volume 8 (Washington: Association for the Study of the Cuban Economy, 1998 pp. 273-288. 3. “Cuban diplomats angered by Forbes estimate of Castro’s wealth,” Mexico City, AP, March 17, 2005; “Tacha Cuba de calumnia información sobre supuesta fortuna de Castro,” Notimex, México, 16 marzo 2005. 4. “Cuban diplomats angered,” op. cit. 5. “Fidel quiere demandar a Forbes por revelar su fortuna,”Infoabe, Argentina, 21 de marzo de 2005. 6. Hidalgo is former chief of staff for Raúl Castro, Minister of the Armed Forces, former member of the Communist Party’s Central Committee, former Cuban Ambassador to the United Nations, and head negotiator for Cuba in talks on the withdrawal of Cuban troops from Angola in the late 1980s. He fled the island by boat to the United States in 2002. 7. Rui Ferreira, “El desertor que huyó de un país ‘alucinante,’” El Nuevo Herald, 30 julio 2002. 8. The 2005 Index of Economic Freedom measures 161 countries against a list of 50 independent variables divided into 10 broad factors of economic freedom. Low scores are more desirable. The higher the score on a factor, the greater the level of government interference in the economy and the less economic freedom a country enjoys. These 50 variables are grouped into the following categories: Trade policy, Fiscal burden of government, Government intervention in the economy, Monetary policy, Capital flows and foreign investment, Banking and finance, Wages and prices, Property rights, Regulation, and Informal market activity (http://www.heritage.org/research/ features/index/). 9. Dariel Alarcón Ramírez, Memoria de un Soldado Cubano: Vida y Muerte de la Revolución. Barcelona: Tusquets Editores, 2003, pp. 276- 280 in particular. 10. The reserve is known as the Reserva Estatal del Comandante. See “The Comandante’s Reserves,” Cuba Monthly Economic Report, Special Issue, August 1997, <http://www.fiu.edu/~fcf/fidelsreserves102097.html>. This report is mostly based on the testimony of Jesús Marzo Fernández, corroborated by accounts from other former insiders. Mr. Fernández left Cuba in May 1996 after holding very highlevel positions in the Cuban government related to Fidel Castro’s accounts and personal business. See also Eugenio Yañez, “La riqueza de Fidel Castro: Mito y Realidad,” La Nueva Cuba, Agosto 17, 2005, <www.futurodecuba.org/la_riqueza_de_fidel_castro_.htm>. 11. One such transaction is reported to have been the sale of the Havana Club rum factories and distilleries to the French firm Pernaud Ricard for an estimated $50 million, which is said to have been deposited in its entirety in the Comandante’s reserves. See “The Comandante’s Reserves,” op. cit. 12. “The Comandante’s Reserves,” op. cit. 13. Manuel de Beunza, a high-ranking intelligence officer who handled foreign business activities for Cuba, reports that the MC Department under the Interior Ministry had at one time 270 companies operating in hard currency under its control, and 100% of their revenue went into Fidel Castro’s accounts. Beunza worked as an intelligence officer for Cuba for 20 years, and for many years he was directly under Antonio de la Guardia, head of the MC Department (interview, Miami, August 8, 2005). 14. Most of the information on GAESA operations and companies comes from a 2001 media account of the testimony of Delfín Fernández, alias “Agent Otto,” in G. Fernández and M.A. Menéndez, “The economic power of the Castro brothers: Interview with ‘Agent Otto,’” Diario 16, June 24, 2001, reprinted in English in Cuba Brief, Center for a Free Cuba, Summer 2001, pp. 9-12. Domingo Amuchástegui, former intelligence officer for the Cuban military and former professor at the Institute for International Relations and at the National Defense College, confirms much of what is reported about GAESA by other former regime insiders cited throughout this work. See Domingo Amuchástegui, “FAR: Mastering Reform,” Cuba in Transition—Volume 10 (Washington: Association for the Study of the Cuban Economy, 2000), p. 438. 15. He is the son of Division General Guillermo Rodríguez del Pozo and is married to Raúl Castro’s daughter, Deborah. See Pablo Alfonso, “España, un paraíso para la jerarquía castrista,” El Nuevo Herald, June 9, 2002. 16. Fernández and Menéndez, op. cit. 17. Fernández and Menéndez, op. cit. 18. Most of the information on GAESA operations and companies comes from Fernández and Menéndez, op. cit. 19. Management of GeoCuba by the military prevents strategic or military sites from appearing on any maps. See Fernández and Menéndez, op. cit. 20. This firm is included in a list provided by Manuel de Beunza, August 8, 2005. 21. J. M. Fernández, telephone interview, 8/2/05. 22. List provided by Manuel Beunza, August 8, 2005. 23. “The Comandante’s Reserves,” op. cit. 24. Foreign entities may not hire workers directly, but employ workers provided by Cubalse. Workers are paid in Cuban pesos at a minimal fraction of the hard currency wages the employment agency gets paid (salaries equal that of workers in state enterprises in equivalent or similar jobs). In the case of foreign joint ventures, the Cuban government appears to be appropriating around 98% of the total value added of labor in the production process; in the case of specialized and highly skilled workers, even more. See Maria C. Werlau, “Foreign investment in Cuba: The limits of commercial engagement,” World Affairs, Vol. 160, No. 7, Fall 1997, pp. 57 and 59. 25. Fernández and Menéndez, op. cit. 26. Fernández and Menéndez, op. cit. 27. Susana Lee, “Mejoró Cubalse su eficiencia económica,” Granma, 12 de marzo del 2003. 28. Jesús Marzo Fernández, telephone interview, August 2, 2005. It should be noted that Cubanacán has also been reported to be part of the GAESA network under the control of Cuba’s Armed Forces and Raúl Castro. 29. The list of blocked entities for countries under U.S. sanctions runs more than 200 pages. See “Specially Designated Nationals,” U.S. Treasury Department’s Office of Foreign Assets Control, http://www.treas.gov/offices/enforcement/ofac/sdn/t11sdn.pdf. Cuban entities are not listed separately. 30. The Cuban government dealt with the end of massive financial support after the demise of Soviet Communism with a series of capitalist- style reforms, including the decriminalization of the holding of U.S. dollars, and a forceful campaign to develop its previously restricted tourist industry. The U.S. government, in turn, eased travel restrictions to Cuba. For a look at U.S. travel and travel restrictions to Cuba, see María C. Werlau, “U.S. travel restrictions to Cuba: Overview and evolution,” Cuba in Transition—Volume 13 (Washington: Association for the Study of the Cuban Economy, 2003), pp. 384-409. 31. Beunza ran a company for Cuba under his name in Montreal, Canada, that employed more than 50 persons and generated revenues of US$20 million annually in legal as well as illegal businesses. He was under close surveillance by Cuban intelligence officers deployed as diplomats to Canada. He deserted in Canada in 1987. 32. Beunza interview, op. cit. The Chilean Max Marambio, better known as “guatón,” was trained in Cuba as an intelligence agent. He is widely known to have direct access to Fidel Castro and the upper echelons of power. 33. See website at https://www.credicorpbank.com. 34. Gerardo Reyes, “Aliados contra el embargo,” El Nuevo Herald, 5 marzo 2003. 35. The first operation was set for US$2 million. Ibid. 36. Ibid. See also, Gerardo Reyes, “Pruebas apuntan a Cuba en caso de narcotráfico,” El Nuevo Herald, Marzo 6, 2003. 37. P. Alfonso, El Nuevo Herald, 2002, op. cit. Among those identified by El Nuevo Herald are Deborah, Raúl Castro’s daughter, married to Luis Alberto Rodríguez López-Calleja, who runs GAESA; Raúl’s other daughter, Mariela, reported to have a large network of business acquaintances and friends in Spain, to where she travels frequently; a grandson of Ramón Castro, Fidel and Raúl’s older brother, who goes by the nickname “Monchi,” runs a restaurant in Tenerife owned by his uncle Raúl; Javier Leal, son of Eusebio Leal, highranking government official and Historian of La Habana, owns an antique store in Barcelona selling Cuban art and relics; the sons of Juan Almeida run businesses abroad and travel back and forth to Cuba: Juan Antonio Almeida runs a restaurant in Madrid and Juan Juan Almeida is in charge of successful businesses in Cancún, México; Lourdes Argivaes, niece of Castro confidante Celia Sánchez and former wife of Ernesto Guevara March, son of Che Guevara, was establishing a restaurant in Marbella. 38. G. Fernández and M.A. Menéndez, “Cuba convierte su embajada en Madrid en un nido de espías; Parte I,” Madrid, Diario 16, 31 de Marzo de 2001. 39. G.Fernández and M.A. Menéndez, “Cuba convierte su embajada en Madrid en un nido de espías; Parte II,” Madrid, Diario 16, 31 de Marzo de 2001. 40. As reported by Manuel Beunza (interview, op. cit.) and an anecdotal reference by Jordi Carrasco-Muñiz, Economic Advisor of the European Union to Cuba based in Havana. Informal conversation with the author, Miami, August 6, 2005. 41. Financing from European countries to Cuba amounted to US$1.6 billion in 2004. See Cuba Facts, Issue 8, February 2005, University of Miami, Institute for Cuban and Cuban-American Studies. 42. Cuba currently has an accumulated external hard currency debt of around US$13.7 billion, held by of Western governments and commercial banks from Japan, Germany, Italy, France, Spain, United Kingdom, Canada, Argentina, and Mexico. In addition it owes 25 billion rubles to the former Soviet Union, Romania, Hungary, and Poland and $6.3 billion in unsatisfied property claims by U.S. citizens whose properties were confiscated in the early days of the Revolution. See “Cuba’s Foreign Debt,” Fact Sheet, U.S. Department of State, Bureau of Western Hemisphere Affairs, Washington, DC, July 24, 2003, <http://www.state.gov/p/wha/rls/fs/22743.htm>. 43. Cuba consistently obtains one of the lowest country credit ratings in the world, barely ahead of Sudan and Haiti, in rankings by Institutional Investor and Euromoney. 44. Fernández and Menéndez, op. cit. 45. General Rafael del Pino is the highest ranking member of the Cuban Armed Forces ever to defect. He began his career in Cuba’s Air Force in 1959. In 1983 he became Brigadier General and was named Second in Command of Cuba’s Air Force. In May 1987 he defected and escaped Cuba with his family. 46. R. del Pino, op. cit, pp. 415-416. 48. Alina M. Lotti, “El bloqueo norteamericano contra Cuba no tiene futuro,”Cuba, Trabajadores Digital – 1/5/03. 49. Calculated at the 15% rate for an averaged receipt of $1,500 per month for 3,000 doctors. In 1999, the Dallas Morning News reported: “Contracts with host governments earn the Castro regime between $1,000 and $2,000 a month per person. The workers themselves say they get small cash stipends, food and shelter and are closely watched to make sure they don’t defect.” Todd Bensman, “Cuba uses humanitarian aid in fight for foothold in Africa; Expertise from doctors, educators fulfills need in developing countries,” The Dallas Morning News, May 9, 1999, Pg. 14A. This is consistent with many other reports from the island. 50. Georgie Anne Geyer, Guerrilla Prince: The Untold Story of Fidel Castro, Third Revised Edition (Kansas City: Andrews McMill Publishing, 2000), p. 371; Rex A. Hudson, Castro’s Americas Department: Coordinating Cuba’s Support for Marxist-Leninist Violence in the Americas (Miami: The Cuban American National Foundation, 1987), <http://www.latinamericanstudies.org/rex-hudson.htm>. 52. “The Comandante’s Reserves,” op. cit. 53. M. Beunza, interview, op. cit. 54. “The Comandante’s Reserves,” op. cit. 55. According to Fernández, the loan requests were presented, as the need arose to Minister Carlos Lage, who decided whether to pass on the request to Castro. Castro would then approve the term and interest rate of the loan. “The Comandante’s Reserves,” op. cit. 57. Roberto Ampuero, a Chilean formerly married to a member of Cuba’s nomenklatura, mentions 25 homes spread over the island. R. Ampuero, Nuestros Años Verde Olivo (Santiago: Editorial Planeta Chilena, 1999). Other sources list 37. 58. Manuel de Beunza claims to have purchased in Canada all materials, furnishings, showers with water recycling mechanisms, generators, and other equipment to outfit one of Castro’s bunkers. This particular bunker could house Fidel, 57 generals, and 100 more persons (M. Beunza, interview, 8/8/05). 59. According to Jesús Marzo Fernández, Castro bought the castle initially for his son “Fidelito” to use with his family, when he went to Vienna to represent Cuba before the International Atomic Energy Agency in the 1980s. At the time, Fernández was stationed at the Cuban Embassy in London, where top Cuban government representatives widely commented on the purchase, handled by the Embassy. A check was issued from an account under Castro’s control at the Havana International Bank (HAVIN Bank), Cuba’s bank in London, for an amount Fernández cannot exactly recollect, but puts between US$13.9 and $17 million (Jesús Marzo Fernández, telephone conversations, 8/2/05 and 10/10/05). The author has received other anecdotal reports of the existence of this castle, owned by Fidel Castro. 60. The ranch in New Delhi was purchased the year before the Seventh Conference of Non-Aligned Nations in New Delhi, March 7- 12, 1983, to afford Castro the required seclusion and security while attending the Conference. Moreover, it was considered a desirable place to have as possible safe haven in case Castro had to exit Cuba. After the Conference, a contingent of at least 50 Cubans remained to guard the property. Current information on the status of this property is unavailable (Jesús Marzo Fernández, telephone conversation 10/10/05). 61. J. M. Fernández, telephone conversation, 10/10/05. 62. See, for example, a report by Movimiento Insurreccional Martiano, “La Fortuna de Castro, denuncia pública del MIM,” Futurodecuba. com, April 24, 2002, <http://www.futurodecuba.org/La%20fortuna %20personal%20del%20%20Fidel%20Castro%20segun %20el%20MIM.htm>. 63. A full list of bibliographic sources is not possible here, but a sample includes: Santiago Botello and Mauricio Angulo, Conexión Habana: Una peligrosa infiltración en las mafias cubanas (Madrid: Ediciones Temas de Hoy, S.A., 2005); José Friedl Zapata, El gran engaño: Fidel Castro y su íntima relación con el narcotráfico internacional (Buenos Aires: Editorial Santiago Apóstol, 2005); Juan F. Benemelis, Las guerras secretas de Fidel Castro (Miami: GAD, 2003), particularly chapters 24, 25 and 26; Rachel Ehrenfeld, Narco-Terrorism and the Cuban Connection (Miami: Cuban American National Foundation, 1988); Brian Freemantle, Chapter 19: “Cuba, Castro and Coke,” pp. 255-266, in The Fix: Inside the World Drug Trade (New York: Tom Doherty Associates, Inc., 1987); Joseph D. Douglass, Jr., Red Cocaine: The Drugging of America (Atlanta: Clarion House, 1990), especially Chapter 19, “Cuba and the rise of narcoterrorism” (pp. 91-105); a number of incisive articles in El Nuevo Herald by its reporter Gerardo Reyes (See Archives at www.elherald.com); and PBS #910, op. cit. 64. Juan Antonio Rodríguez Mernier, Cuba por dentro: El MININT (Miami: Ediciones Universal, 1994), pp. 78, 99. 65. Rodríguez Mernier, op. cit., p. 99. 66. Geyer, op. cit., p. 371. 67. Rafael del Pino, Proa a la libertad (Mexico: Editorial Planeta, 1991), pp. 426-431. 68. Ibid. See Epilogue, “Fidel Castro y el Narctoráfico,” pp. 383-432. 69. Joseph D. Douglass, Jr., Drug War on the West, The New American, April 10, 2000,<http://www.stoptheftaa.org/artman/publish/article_81.shtml>. 70. In the past, Manuel Piñeiro (alias “Barbarroja”) head of Cuba’s former subversive arm for the hemisphere—the Americas Department—received the funds, over which Fidel Castro had discretion. See Alarcón Ramírez, op. cit., p. 276. Other such accounts appear in Hudson, op. cit. ; Benemelis, op. cit. ; and Masetti, op. cit. 71. See, among others, Rodríguez Mernier, op. cit., p. 99; R. del Pino, op. cit., p. 419 and 428. Norberto Fuentes, Dulces Guerreros Cubanos (Barcelona: Editorial Seix Barral, 1999) and Narcotráfico y tareas revolucionarias: el concepto cubano (Ediciones Universal: Miami, 2002); Jorge Masetti, In the Pirate’s Den: My Life as a Secret Agent for Castro (San Francisco: Encounter Books, 1993), and Alarcón Ramírez, op. cit., are packed with examples. 72. Fuentes, Narcotráfico, p. 92. 73. “Felo,” was an Interior Ministry Colonel with 25 years of service when, as a staffer to Interior Minister Abrahantes, he fell in disgrace during the 1989 Ochoa affair/purge. He served a year of prison and in 1993 he fled Cuba by boat with his family. He lives in hiding in Miami, under death threats from Cuba. 74. Masetti, op. cit. Masetti, Argentine-born, became a revolutionary and international terrorist under Cuba’s tutelage. He married the daughter of top Cuban Intelligence agent Antonio de la Guardia. When de la Guardia was executed during the Ochoa affair, Masetti and his wife Ileana were allowed to go into exile in France. 75. Massetti, op. cit., pp. 75-77. 76. Other accounts of the kidnapping appear in Fuentes, Narcotráfico, p. 89 and Mario Diament, “La historia secreta del botín de los Montoneros, obtenidos con terrorismo, atracos y secuestros,” Miami, 1996 <http://www.cubaeuropa.com/historia/Articulos/Montoneros. htm>. 78. See detailed accounts in Andés Oppenheimer, Castro´s Final Hour (New York: Touchstone, Simon & Shuster, 1993); del Pino, op. cit., pp. 383-432; and Friedl Zapata, op. cit, pp. 131-192. 79. Friedl Zapata, op. cit., p. 197. Ileana de la Guardia’s testimony was given at a Hearing of the U.S. House of Representatives, Subcommittee on Government Reform, November 17, 1999. 80. “The Comandante’s Reserves,” op. cit. 81. Rodríguez Mernier, op. cit., p. 79. 82. Beunza, interview, op. cit. 83. Fernández and Menéndez, op. cit. Agent Otto confirmed that the Castro brothers have Swiss bank accounts and disclosed that he personally delivered suitcases with money to individuals abroad. He clarifies, however, that money delivery was not part of his duties. 84. When U.S. forces entered Baghdad in April 2003 they discovered in presidential palaces millions of dollars in U.S. currency, much of it in $100 banknotes, neatly wrapped in plastic and bearing the markings of the Federal Reserve Banks of New York, Boston, and Philadelphia. Iraq was under the tightest U.S. sanctions at the time and no fresh U.S. currency should have been there, especially in the quantities and qualities discovered. The New York Federal Reserve Bank began an investigation into how the currency got to Iraq. Subsequent investigations involving the Fed and the Swiss Banking Commission turned up evidence that the UBS Investment Bank’s Zurich branch had engaged in U.S. banknote transactions with Iran (about $450 million), Libya (about $30 million), Yugoslavia (less than $1 million), and Cuba (about $3.9 billion). The Swiss Federal Banking Commission issued a formal public reprimand to the largest bank in Switzerland. UBS staff said to be involved in the banknote transactions lost their jobs and UBS paid the civil penalty fine. The UBS business franchise ceased to exist. See Senate 108-752, Oversight of the Extended Custodial Inventory Program, Hearing before the Committee on Banking, Housing and Urban Affairs, May 20, 2004; and Background materials of the U.S. Senate Banking Committee Staff in preparation for the hearing, May 19, 2004. 85. Presumably, it did so for the purposes of the investigation that ended in the fine. OFAC prepared a report, which has not been made public. 86. Mary Anastasia O’Grady, “Castro’s Scheme To Shake Down The Miami Cubans,” The Wall Street Journal, November 12, 2004, p. A13. See also, Ernesto Betancourt, “Cuba lavó US$ 3,900 millones en banco suizo,” El Nuevo Herald, junio 5, 2004; Betancourt, “Más sobre el escándalo del lavado de dinero,” El Nuevo Herald, julio 17, 2004; and Betancourt, “¿Se acabó el lavado de dinero?,” El Nuevo Herald, abril 2 de 2005. 88. del Pino, op. cit., p. 407, relates how Castro, in a moment of impulsivity during a trip to Nicaragua, donated to that country a US$40 million sugar mill, built by Cuba. 89. In 2003, Cuba’s Foreign Minister Felipe Pérez Roque reported that at the time 13,000 youngsters from 100 different countries were studying in Cuba, 8,000 of those in Medical School. See Lotti, op. cit. Most, if not all, are understood to enjoy scholarships from the Cuban government. In 2002, for example, Cuban media reported that Cuba gave 11,366 scholarships to foreigners to study on the island, and that a year of study for each medical student cost between US $7,000 to $9,000 thousand. Yolanda Martínez, “Abre Cuba puerta a mexicanos,” Mural, febrero 2 de 2004. 90. One recent case is that of the young son of a prominent Chilean right-wing politician, Andrés Allamand, who had been brain damaged from near drowning in the family’s pool. Cuban specialists were sent to Chile to evaluate and treat the child. Then, he and members of his family were flown to Cuba, where he was treated for some time, returning to Chile with a staff of dedicated Cuban medical personnel. Allegedly, most if not all, of the expenses related to this case were covered by the Cuban government. This account was related to the author by several close friends of the Allamand family. 91. Juan Benemelis’ excellent compendium is a primer on this issue. See Benemelis, op. cit. Masetti, Alarcón Ramírez and other former insiders relate many insightful anecdotes on this matter. Manuel de Beunza, for example, reports having traveled with his then boss Antonio de la Guardia to Lebanon with several steel suitcases containing US$25 million for Yasser Arafat, which they handed to him personally. Beunza, Interview, 8/8/05). General del Pino, op. cit., p. 253, relates how in 1980 Fidel Castro on a whim approved a US$60 million budget for the construction of a large air base in Nicaragua, in Punta Huetes, approximately 20 miles from Managua. 92. Cuba, a country of eleven million and the second lowest GDP per capita in the Western Hemisphere (after Haiti), maintains a huge presence at international organizations. Its Mission to the United Nations in New York, one of the costliest cities in the world, exceeds that of most countries—including the likes of China, Russia, France, Brazil—in number of diplomatic representatives. 93. For example, Castro places enormous attention on promoting the proposition that Cuba is a world leader in education and health and spends huge resources on conveying this message worldwide. General del Pino, op. cit, p. 250, explains that Castro believes that anyone who has been given free education or medical attention will become an ally or at least never be an enemy. As a result, Fidel spends countless millions delivering medical assistance globally in the form of vaccines and other resources, hosting many foreigners in Cuba for medical attention at no cost to them, and giving scholarships for foreigners to study Medicine in exclusive universities on the island not available to Cubans. See, e.g., “Cuba envía brigada médica a Colombia por terremoto,” Reuters, La Habana, Febrero 12, 1999; Anita Snow, “Chernobyl Victims Get Help in Cuba,” The Associated Press, May 27, 1999; Todd Bensman, op. cit. 94. A former member of Castro’s security detail, second in command of an elite anti-terrorism and anti-kidnapping military unit, reported in 1999 that his group was one of several within a security entourage of about 1,000 men protecting Castro. Ana Acle, “Ex-Castro bodyguard describes Fidel’s fear,” The Miami Herald, June 15, 1999. 95. “Four decades of watching the back of Cuba’s ‘El Jefe,’” Havana, Associated Press, January 7, 2002, <http://www.latinamericanstudies. org/fidel/watching.htm>. The agent alleges that his security group was one of several within a security entourage of about 1,000 men who protect Castro. During a 16-hour layover in Brasilia on his way back from South Africa, Brazilian hotel executives reported that Castro occupied the presidential suite of the deluxe Naoum hotel at a daily rate of $1,560. An entourage of 89 occupied 45 rooms. The bill for the one-day stay totaled almost US$20,000. “Castro regresa a la isla tras hacer escala en Brasilia,” Brasilia, Associated Press, in El Nuevo Herald, 4 de septiembre de 2001. A stopover in Vancouver, Canada, on his way back to Havana from an eleven-day trip to Asia was reported by the Canadian press to require refueling for the three planes in which Fidel brought his 175-member delegation. Derrick Penner, “Take care of the salmon,’ Castro advises during Vancouver stopover,” The Vancouver Sun, March 5, 2003. 96. Roberto Ampuero, a Chilean revolutionary who in the 1970s married the daughter of Cuba’s Attorney General, in a biographical novel depicts the privileged lifestyle of a select few in Castro’s inner circle. Ampuero soon became disaffected with the Cuban Revolution as he witnessed rampant corruption by the Cuban political elite living in the mansions of those who had fled the country, with servants, drivers, and plentiful access to food and all sorts of consumer goods while the Cuban population was under strict food rationing and material deprivation. See Ampuero, op. cit. 97. Juan O. Tamayo, The Miami Herald, 10/8/2000. 98. According to Rodríguez Mernier, op. cit., pp. 277-278, Minister of the Interiror Abrahantes is said to have stationed a Secret Policy Mayor with his family in China just to provide him with shrimp, one in Mexico to provide his with Chesterfield and Camel cigarettes, and one in Paris to deliver cosmetics and perfumes. Fidel Castro not only allowed this, but took advantage of it, partaking from Abrahantes’ “small reserve” to send gifts to diplomats, high-ranking government officials, and for his own personal use. Fidel would send Colonel Cesareo by car to the secret and heavily guarded warehouse in Siboney. According to “Benigno,” in the eighties, Abrahantes and the de la Guardia brothers had large discretion over hard currency funds generated through the MC Department of the Interior Ministry. Abrahantes managed all of Castro’s personal luxury goods, including a cognac-making facility in the Isle of Youth that ships out the bottles in wooden boxes labeled “Gift from the Council of State. Fidel Castro,” a separate cigar rolling facility in Cubanacán, with the best tobacco rollers in the country for his own brand “Laguito,” a climate controlled warehouse for his cache of cigars, and a warehouse stashed with all sorts of appliances inaccessible to the population, including dishwashers, which are a rarity in Cuba. Alarcón Ramírez, op. cit., pp. 276-278. 99. Wilfredo Cancio Isla, “Corrupción en la cúpula empresarial cubana,” El Nuevo Herald, 16 de febrero del 2004. 100. Several experts on the Cuban military have written about its direct and critical involvement in the management of the economy, particularly in the tourist industry. See for example, Domingo Amuchástegui, op. cit., and Armando Mastrapa, “Soldiers and Businessmen: The FAR During the Special Period,” Cuba in Transition—Volume 10 (Washington: Association for the Study of the Cuban Economy, August 2000). 101. Mastrapa, op. cit, p. 431. 102. The GCA is a notable route to the pinnacle of power in Cuba. Among its former members are Carlos Lage, now Vice President of the Council of State, and Felipe Pérez Roque, currently Foreign Minister. See Armando Mastrapa, “Equipo de Coordinación y Apoyo al Comandante: Cuba’s Parallel Government?” Cuba in Transition—Volume 11 (Washington: Association for the Study of the Cuban Economy, 2001), pp. 476-480. 104. Former Cuban intelligence officer Juan Antonio Rodríguez Mernier reports that in the 1980s, Cuba’s Ministry of the Interior employed 100,000 people (the Cuban population was then around 10 million), with half a million agents generating the bulk of the intelligence data and up to three million sources, to be activated when necessary. Rodríguez Mernier, op. cit., p. 51. 105. The Communist Party controls all government positions and the regime exercises control over all aspects of life; even the judiciary is subordinate to the Party. A huge and intricate system of spies, informants, and neighborhood block committees monitor and controls the citizenry and communications from abroad an access to the internet are strictly controlled. See, for example, Cuba’s Repressive Machinery: Human Rights Forty Years After the Revolution, by Human Rights Watch, June 1999; and Cuba: Country Reports on Human Rights Practices—2004, U.S. Department of State. 106. Rafael del Pino, “Perspectiva,” El Nuevo Día, 23 de abril del 1989. 107. Fernández and Menéndez, op. cit. 109. Foreign Minister Roberto Robaina was fired and placed under house arrest for engaging in “dishonest” international business ventures without the approval of the government and for his personal benefit and for “sharing state secrets” (reportedly for expressing dissatisfaction with certain policy decisions of Fidel Castro). Robaina came under fire just at the time that Mario Villanueva, the former Mexican governor of Quintana Roo, went into hiding to avoid charges of drug trafficking. Robaina was accused of accepting money from Villanueva, who was later apprehended and convicted of drug trafficking and whose extradition the United States had requested for shipping cocaine there. Although Villanueva was later exonerated by a Mexican court, the case bears striking similarities with the Ochoa affair, although Robaina’s life was spared. Gerardo Arreola, “Expulsa el PC cubano “deshonrosamente” al ex canciller Roberto Robaina; lo acusa de corrupción,” La Jornada, Mexico, 31 de Julio del 2002; “Cuba: el ex canciller Roberto Robaina habla con CNN,” La Habana, CNN, 4 de agosto de 2002; EE.UU. pide extradicion de ex gobernador mexicano Mario Villanueva, USA, 25 de enero del 2002; Pablo Alfonso, “Comienza a develarse el ‘misterio’ de la destitución de Robaina,” El Nuevo Herald, 6 de octubre de 1999. 110. Fuentes, Narcotráfico, p. 107. 113. Wilfredo Cancio Isla, op. cit. 114. Moisés Leonardo Rodríguez, “High-ranking Cuban government officials arrested in corruption sweep,” Havana, April 15, 2004, CubaNet, April 19, 2004. 115. OFAC lists the company as Galax Trading Co.
116. OFAC lists DICESA also as Desarrollo Industrial Cubano Español, with José Lázaro Caldeano as principal. 117. OFAC lists this company as c/o Anglo Caribbean Shipping Co. of London. 118. Adolfo Prieto is listed in both Beunza and OFAC’s list as the principal for this company. 119. Alejandro Abood is listed at the principal for this company in OFAC’s listing. 120. Listed by OFAC as c/o Empresa de Navegación del Caribe of Havana. OFAC also lists Guamatur in Argentina, Chile, and Panama. 121. Havanatur is also listed by OFAC in Hialeah, Florida; Montreal, Canada; and Buenos Aires, Argentina. 122. OFAC lists it also a/k/a Transover, S.A.